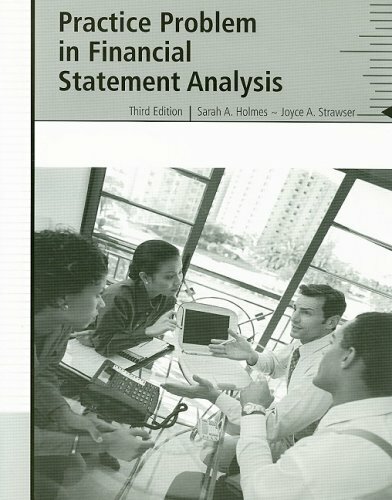 A Practice Problem in Financial Statement Analysis gives students the opportunity to familiarize themselves with several types of financial statements. With the use of an anuual report, students will have a hands on experience financially anaylzing a company. private organization charged with responsibility for setting U.S. financial accounting and reporting standards. She worked full-time on the project on postretirement benefits other than pensions (OPEB) and was heavily involved in researching and developing staff recommendations on the accounting requirements which were subsequently incorporated into Statement of Financial Accounting Standards No. 106, ?Employers? Accounting for Postretirement Benefits Other Than Pensions.? Dr. Strawser earned a B.B.A. in accounting from Texas A&M University and a Ph.D. in accounting from Louisiana State University. Prior to beginning her doctoral studies, she worked as a staff accountant for the Houston office of Arthur Andersen & Co. Dr. Strawser has successfully completed the uniform CPA examination and is a member of the American Accounting Association.